And final destination: The Big Apple...yay! I have been invited by Sun Labs, the makers of the SUN self-tanner that I used in a video a while back. They were so excited about the video, that they invited me to New York to go to the International Beauty Show in New York, on Sunday, March 7th at the Jacob Javits Convention Center. I am so excited! I will get to visit with people at their booth at the IBS show! If you are in the NY area, please come by and say hi!!! I am so excited, I really love NY, and I can't wait to soak up some more New York dazzle! I am packing treasures....my video camera to document everything...to take you guys along with me!!!! I still don't know what I am going to wear or where all my make-up is...ha ha ha...and I always have that feeling that I am forgetting something! huge love....and check back for my travel updates...and what I finally ended up wearing....ha ha ha ha! I'm going to have an "empire state of mind"!!!! and you're coming with me!!! Have a fun and safe trip Kandee! Kandee, I hope you have a great time in New York! Be careful but enjoy yourself! Love you and your vids for making me smile! yay! Let's go! I've never been there. So nice that they invited you! I love your style, your so colorfull, I love your colorfull soul! I wish I could met you some day. Kandee, Hey Lovely... I just wanted to tell you I am so EXCITED cant wait to see new videos and I hope you have a GREAT time and be safe.. See you soon!! lol :) Yay for a Awesome day!! Thanks again for all your positive words! I really like the quote of the day! You're great, but I think you already know that! :) I love reading your posts. Have so much fun.. NYC is def cold compared to Cali so I hope you packed warm... Can't wait to hear all about it! Good luck in the Big Apple Kandee!!!! Have lots of fun!!!! Kandee, I have 2 questions for you. This is the question I need answered the most out of the 2: #1 Before I put on shadow or eyeliner or both, I either prime my eye with "eye shadow base" from ulta or my liquid foundation. Then, I either put some face powder on the eye area or some neutral eye shadow all over to prime my eye. After wearing my makeup for a little while, I always get this line from my eyeliner above my eyelid, and it looks so bad and silly lol. Also, I always use a pencil eyeliner, if that makes any difference, I don't know. How can I change what I'm doing to avoid this? Thanks! #2 Also, when I use a black pencil liner, it always turns blueish later on the top lid. I've tried putting nyx black shadow on top of the liner, but it still looks blueish later. So I guess the shadow is turning blueish too. What can I do to avoid this? Maybe it's the brands I'm buying? I don't know lol. If you could answer one or both of these questions in one of your videos that would be great. Thanks! but i wish you a great stay and have some fun in NYC! Here on your site just jammin to the jay z vid you posted. Love your blog and everthing you do. I think that you rock, so keep being you! Have fun in the NYC! Hy Kandee, that's great news! I can't wait to see pictures !! Hope your well there. I also love this song, because I'm from Europe and I've never been to NY , I'm just dreaming about it! kandee! You will love love love the IBS show!! 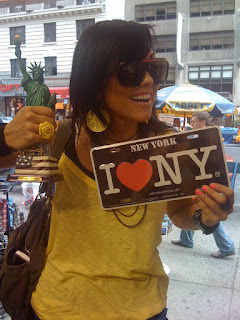 I Heart New York as well and think your positivity is infectious! Hiiii kandee!!! im new on your blog... i found you when i was researching on youtube videos to learn about make-up.. but i didn´t know how amazing person u could be until i start reading this blog!!! ... you are great!! hope u have the time of yout life on NYC!!! u deserve it!!! and thanks for all your words!!! Wow! What am opportunity. Shows what a great spokesperson you'd make that they contacted you just from a personal video. You go, girl! Have fun Kandee!!! Me and my family might be going to New York for a marriage and I might be coming to California for traveling!!! I can`t wait to meet you! thanks for that quote it is definitely going on my closet, wallet, and school books! Woohoo! Im so happy for you. I hope you dont get too nervous on the plane :S just remember how fun and beautiful all will be when you step off the plane! HAVE A LOT OF FUN! take a lot of pictures and take care! I send you lots love and hugs!! Hi Kandee I've been trying to follow you on your page "adventures in Kandeeland" but I can't go in. I love reading it. Could you please tell me what can I do? I hope you have a wonderful time in NY. Please answer me sweety. LOVE. PLEASE PLEASE PLEASE tell me how long will you gonna stay? Are you planing to do anything else? I'm from Brazil and I'm arriving there on monday! If there's a chance for you to go to sephora or some place like that, pleaaaaaaaaaaaaaaase tell me...I can offer my medicals tips in return for your make up tips! hahaha! Have a great time!!! You deserve it!!! Wow that's great Kandee. I'll be at the show on Sunday and I'll get to meet you! See you then! Welcome to NY! The weather is supposed to be a lot less freezing than it has been, and no snow (probably.) Seriously though, we're expecting the best weather we've had since fall. it looks really great for artists, but not for regular people because it has some big pallettes. Welllll, its pretty good prices and really good-looking stuff! (: but i don't know how good the quality is, but maybe you could try something(: maybe even make a video if you like it? or not? haha thanks! you are gorgeous and uplifting and absolutely ligit! okay im done now so byee!! Hey Kandee.....just wondering if you could tell us that commented on the "leave britney alone" tutorial what is on your lips in the sidebar of it's YT page....it's beautiful and a million of us are wondering.....thought you would more likely see this here than there....enjoy your time in NY you deserve the trip! Damn girl! You lucky child! =) That's awesome! Have a fun and safe trip! Relax and love the life in New York! I'm going to be there on tuesday the 9th, I'm going for students day with my cosmetology class!!!! Do you think you will still be there on that day?!? That would be soooo amazing!!!! By the way, unfortunately, the song "Empire State of Mind" it completely disses the Church and Christianity. I just wanted you to know... it says "Jesus can't save you and life starts when the church ends." Would love to go, but you have to be a pro to register?! How exciting!You are going to have so much fun! You have such a positive outlook that really comes across on your blog. It is very refreshing! Have lots of fun on your trip to NY, hope you meet lots of great ppl! thats always been a dream of mine ! make sure you put on a video of how your trip went ! Just found your blog this week... Love. it. Thanks for all the great tips! This mama needs all the help a gal can get. Ha!